Nowadays, an American in India would probably expect to keep in touch with his family back home by telephone or e-mail. But during World War II, that wasn't possible. The main reason was (in 21st-century terms) a severe lack of telecommunications bandwidth between the two continents. A few telegraph circuits existed, so telegrams or "cables" could be sent; but they generally had to be kept very brief. When my father landed in Bombay, the soldiers were allowed to send cablegrams home, but the body of the message was limited to three sentences chosen from a pre-selected menu. If that menu had 32 choices such as "Arrived safely," the entire body of the message could be transmitted in a single byte of 16 bits! With electronic communication almost non-existent, the soldiers and their families had to stay in touch by what some now call "snail mail"  actual written documents physically shipped from one place to another. And make no mistake, that mail was important. According to the Smithsonian Institution, mail "has long been a critical factor in maintaining servicemen and women's morale during wartime. Military commanders acknowledge that frequent contact between families separated during war helps strengthen fortitude, makes loneliness endurable, and provides needed reassurance." But shipping all that mail back and forth between the United States and its troops overseas was a major undertaking. It had to be done, but transport space was also needed for war matériel and for the troops themselves. So in 1942 the Post Office instituted a space-saving project called "V-Mail," after V for Victory. V-Mail had been developed by the British. The sender wrote his message on one side of a pre-printed sheet of paper. After approval by the military censors if necessary, this sheet then was photographed onto 16-millimeter microfilm. It was the rolls of microfilm that were shipped across the ocean. A single mail sack could carry the microfilm representing 150,000 single-page letters, which in their original form would have weighed more than 50 times as much. When the microfilm arrived near the letters' destination, it was printed out on little sheets of photographic paper. To save costs, the prints were only about a quarter of the original size. Each was folded and placed in a little envelope, 4¾ by 3¾ inches, which then was delivered to the addressee. Here, for a comparison of size, are a 25-cent piece and the two sizes of V-Mail. The original form is 8¼ by 11¼ inches. The reduced-size photographic print (of a different letter) is 4¼ by 5 inches. One page didn't provide a lot of room. Notice how in both letters, Vernon had to cram in his final words and signature at the bottom. If he wanted to write several pages, he had to send them as several separate V-Mails. In 1944, he sent my mother at least four V-Mails on March 18, and again on March 21, and again on March 23. Because the order in which they would be received was uncertain, he didn't write one as a continuation of the previous letter; each little single-page letter was a self-contained unit. Regular first-class mail (including airmail) was still available between the States and the troops overseas, and according to one statistic, regular mail was used seven times as much as V-Mail. But V-Mail conserved resources. It was the patriotic way to communicate. A million pieces a day were sent. From my father's letters, here are a few excerpts that discuss the service. Your latest letter was dated February 3rd and received on the 26th. Twenty-three days isn't too bad, considering this is our first mail. When I become settled, I should receive mail in two weeks or so, and so should you. Have been wondering if my letters to you via V-Mail could be read when you do receive them. It seems that I have a tendency to write small at times and also to run my lines together, so I would like a report on how they are. V-Mail would probably be the fastest way for your mail to reach me, too (of course, unless I move, and then your guess is as good as mine). I suggest airmail on the thin paper or V-Mail, as regular mail is bound to be a bit slower. One of the fellows has been getting some of his mail back because the censors cannot read his handwriting. I have begun to wonder if, after my writing has been reduced due to photography, you are able to read it. Report, please. Received mail this morning, one from Aunt Patt. Her letter was a V-Mail, only it was not suitable for filming so was sent in its original form. You will no doubt be wondering why I haven't written you an airmail for a few days, so I will tell you without you asking. My supply of airmail stationery is somewhat limited and the PX has been temporarily out also, so I decided that I could write several V-Mail letters and tell you just as much as one airmail and thereby conserve my stationery. And, too, there isn't any cost nor any shortage of V-Mail forms. They are supplied free of charge by the Post Office, and all we want. 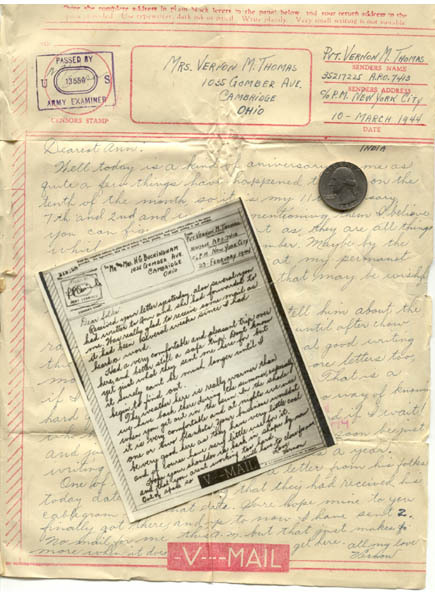 Click here to return to the main collection of letters from India.